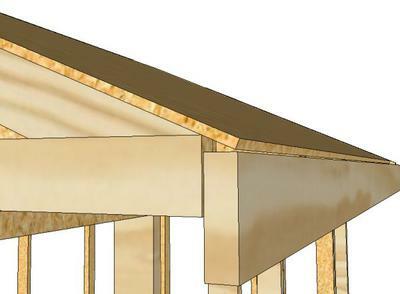 I have never done a construction project like this, and this will likely seem fairly simple, but do I need to cut angles on the plywood sheeting where they meet at the peak, or will this matter in the end? 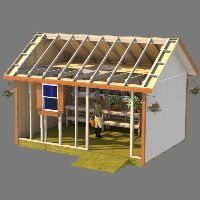 I am building the salt box style shed, and can't determine this question from the plans. Also, does the sheeting hang over the fascia at all?. 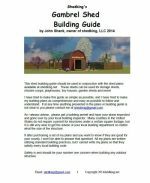 Those are both great questions and I have attached a few pictures that will hopefully clear up your confusion about some of the construction details of your saltbox shed roof. As you can see from the picture showing the roof panels at the peak, you do not have to cut those at an angle where they meet. The are just placed as shown right at the truss peak and nailed into place. If you were going to install a ridge vent you would want to place them about 1.5" down from the peak to allow for ventilation through the ridge vent. As for the roof panel placement down at the front fascia, you can determine the exact placement of each one by first taking a small scrap piece of OSB or plywood, and a small scrap piece of your fascia and line them up as shown in the picture and that way you can determine where the full pieces need to be placed in order to get this arrangement to work out. 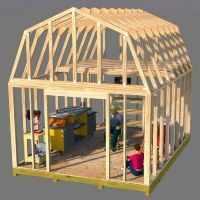 Hope this helps to answer your question about your saltbox shed roof, and thank you Scott for buying a set of my plans! 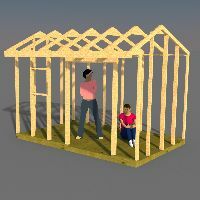 Hope you enjoy building the shed, and I hope it gives you many years of use! Join in and write your own page! It's easy to do. How? Simply click here to return to Shed Roof Questions.